G7c and G7x employee-worn devices connect your team to real people, ensuring industry-leading live monitoring accompanies your workers wherever they operate. For businesses without a control room or always-available supervisors, Blackline’s in-house Safety Operations Center (SOC) is staffed 24/7 with professionally trained monitoring agents focused exclusively on ensuring the well-being of employees’ safety. Specializing in Blackline Safety monitoring devices, the SOC provides organizations with expert safety monitoring and support, without sacrificing business productivity. Blackline’s SOC expertly manages alerts from receipt through to resolution for over 7,500 active devices around the world. 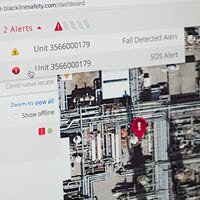 The Blackline Live monitoring portal shows the comprehensive safety status of every team member at a glance on a live, real-time map. Personnel can easily view the type and status of an alert the moment it happens — G7 automatically communicates incident details to Blackline Live, from injuries and health events to gas detection and evacuations. Supervisors can be alerted of an event as it happens, keeping them up to date on the safety status of their team members. Armed with these critical insights, monitoring personnel are always prepared to spring into action. Each alert is managed according to customized emergency response protocols, with an escalation process determining who should be contacted during an incident. Monitoring teams can contact and dispatch nearby coworkers, all the way up to EMS, fire or police services. Transparent response-time reporting enforces the SOC’s superior performance standards. From onset through to resolution, all activities are time-stamped for future reporting and review, including notes used to document the response. With 99.5% of alerts receiving a response in under a minute, Blackline’s SOC facilitates worry-free monitoring services and support, so employees can take comfort knowing their safety is always covered. SOC utilizes the Blackline Live web portal, providing them with critical insights into emergency alerts in real-time. Delivering situational awareness communicated from employee-worn devices in the field, Blackline Live provides all the tools necessary for the SOC to manage a world-class emergency response. G7 continuously streams real-time safety data to Blackline Live for monitoring personnel and on-demand reporting. An online dashboard summarizes the real-time safety status and usage statistics of fielded devices and gas detection compliance status. It also prompts corrective action when a device becomes out of compliance, helping to ensure that equipment is being used according to company policy and standards. Monitoring personnel leverage G7 and Blackline Live to trigger and monitor the progress of evacuations. Personnel are able to scale evacuation alerts and communicate evacuation instructions to an individual device or an entire fleet. Blackline Live allows personnel to deliver a text or recorded voice message to targeted employees with directions on how to proceed to designated muster points, accounting for everyone’s safety along the way. G7c is the world’s first personal monitoring device to deliver an industrial-quality speakerphone. SOC personnel or in-house monitoring teams can communicate directly with workers in distress, even in noisy environments. Constant connectivity provides monitoring personnel with critical insights and situational awareness.